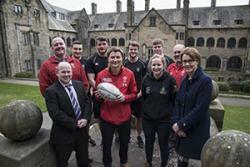 Talented young rugby players could realise their dream of playing for Wales thanks to a nurturing new partnership between Bangor University and Rygbi Gogledd Cymru (RGC). Through Bangor University’s sports scholarships for elite athletes, seven students who play for RGC, the regional rugby side for north Wales, have been able to progress into higher education whilst being able to continue to play rugby at high level. Sports Scholarships are awarded to recognise and support sporting excellence and achievement. They are aimed at helping talented and high performance students to combine their academic study and sporting performance to assist them in achieving their full potential. The players who received a scholarship are Danny Cross, 19, from Wrexham; Ianto Pari, 19, from Aberdaron; James Lang, Rhun Williams, 18, from Pontrug; Sam Jones, 18, from Llanidloes; Sean Lonsdale, 18, from Prestatyn and Will Bryan, 19, from Caerwys. This new partnership will allow players identified by RGC to stay in north Wales to study and develop their rugby. RGC was set up in 2011 to help improve the opportunities available for the best rugby players from north Wales. In their first few years, RGC worked mainly with players aged under 18 in further education, but a need for a post-18 pathway soon developed. Marc Roberts, WRU Regional Rugby Manager, said: "Traditionally the best players were drawn to south Wales, with the aims of playing for one of the four professional Welsh regions - the Scarlets, Ospreys, Cardiff Blues or the Dragons. The work of the RGC Academy through to the senior side has enabled players to have a clear pathway to continue to develop their rugby skills. RGC is also fully committed to develop players off the field, and we are able to achieve this by giving them the option of a career after rugby. Rhun Williams’ recent success with the Wales U20 squad is testament that this partnership will carve a successful pathway for the talent in the north." Bangor University recognised and rewarded local Welsh International, George North, for his services to sport in 2014 where he was presented with an Honorary Fellowship during graduation week.